Do you know how much it costs to advertise your brand name on every single major tech or non-tech news outlet online for 1 month straight? I don’t have the exact figure but I am willing to bet it costs much more than 32 million. Microsoft with Windows 8 and Motorola with the new Moto X is rumored to be spending more than 1 billion dollars on advertising for their products. Ubuntu, on the other hand, is not a daily household name, so any type of free month-long exposure is a good thing. It has the side-effect of getting funded for a physical product and perhaps a serious entry in the mobile market. Not everyone likes Ubuntu or Canonical, but that’s ok. FOSS projects and supporters are big on hating each other, even if it at the expense of it own demise. Linus argued the reason Linux distribution is not big on consumer desktop as it is in embedded devices, servers, and mobile devices because there are not enough pre-installed Linux distribution on consumer PC. One of the reason Windows survives and Linux don’t on the desktop because consumer doesn’t have to download ISO and create a partition in order try a new untested OS and see if it works. Windows come pre-installed and consumers just use it. Ubuntu Edge has the potential to solve this problem by having Linux distro pre-installed as full-blown Desktop OS right at the palm of your hand. We will have to wait and see if it will actually work in reality, but in my opinion, this is the best attempt yet to tackle the problem of Linux user base on consumer desktop. Currently, mobile device market is a duopoly ruled by Google’s Android and Apple’s iOS, there is some smaller competition like Windows, Blackberry and to a much lesser extend FirefoxOS; but they have a very little market share or serious fan following. We need some serious competition and preferably from the Open Source community and in my opinion Ubuntu Edge is the ideal candidate. It adds some unique features and unique UI elements that differentiates itself from the current status quo. Unlike Android, its a full-blown Linux OS, with presumably much finer control on the overall device. Its very difficult to get into partnership with major phone service providers like Verizon or AT&T, unless you have good recognition or deep pocket. FirefoxOS was able to get into a partnership because Mozilla has more name recognition and much deeper pocket than Ubuntu or Canonical. By reaching the goal in the biggest crowd funding project in such a short time, and having most of the internet tech community talking about it, they can get mobile carriers interested in having ubuntu as an option by getting market validation from this experiment. Like it or not, Personal computer in the form of desktop or laptop is slowly dying a miserable death. It will still exist for professionals who needs a powerful dedicated device, but those people are the minorities. Most people use their computers for entertainment but slowly mobile devices are becoming powerful and feature complete enough to replace traditional PC. 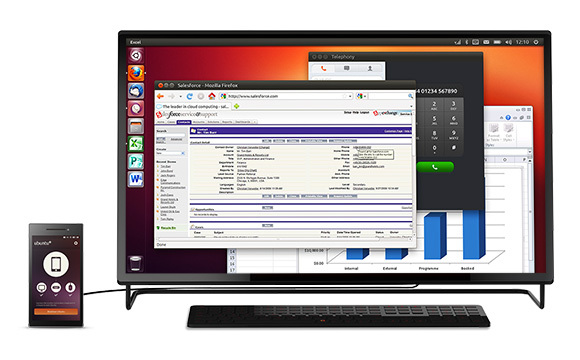 As it is Ubuntu takes a very small slice of existing desktop market. With the eventual demise of the desktop as a widely used consumer product, Ubuntu (or any consumer Linux distro for that matter) will have a hard time staying relevant. The only way to survive is to adapt to the market like everyone else is doing. As far as Ubuntu is concerned it’s also a question of survival for Ubuntu as a Linux distro (not on the server side, though). I predict that in the near future other distributions will follow suit and will have a mobile version of their OS. In the end, the Linux and FOSS community need to put their money where their mouth is. It’s not every day that you get to help put Linux in the mainstream market. The Ubuntu community alone is big enough to finance this project, the FOSS community is even bigger. I suspect, this project will get financed, if it doesn’t, to me it would be a bit of a tragedy.